Pork chops cut are relatively lean, especially the meat taken from the center loin. Searing the meat in a cast iron pan, then transferring the pork chops to the oven to finish cooking will help to seal in the natural juices. The flavors of the pork chops blend well with the sweet and tart flavors of a red wine and fig sauce. Once the pork chops are finished cooking, place them on a platter and cover them with foil. This resting time loosens up the juices and redistributes them throughout the pork chops. Season to taste each side of the pork chops with salt and pepper. Heat the olive oil in a heavy oven-proof skillet over medium to high heat. Sear the pork chops for one to two minutes per side, until lightly browned. Transfer the pork chops into the oven to roast for approximately eight minutes or until the internal temperature reaches 145 degrees Fahrenheit. 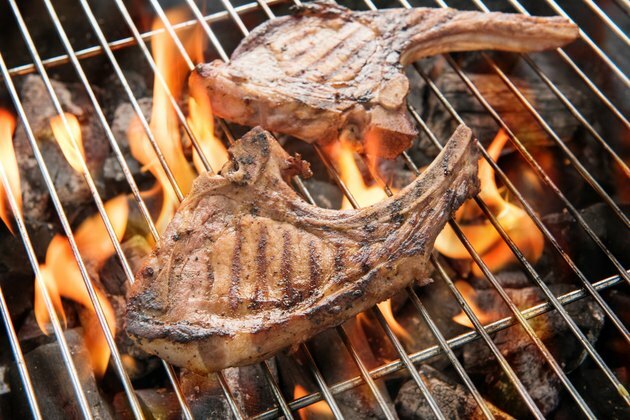 Cover the cooked pork chops with a tent of foil and allow them to rest for five to 10 minutes. Add the red wine and chicken broth to the frying pan. Cook the sauce for five minutes, scraping any brown bits from the pan. Stir in the figs, thyme and butter, and stir the sauce until the butter is melted. Drizzle the pork chops with the fig sauce and serve. Pork chops are delicious with potatoes or rice and a fresh green salad.